I’ve been wanting to buy myself a new Lamy pen for quite some time. I was looking at either getting the black Safari, AL-star, or Vista. I’d looked up pen stores in Dublin before my trip and narrowed down to discovered Pen Corner. I’m happy that I didn’t go entirely broke shopping there. I got myself the black Safari. 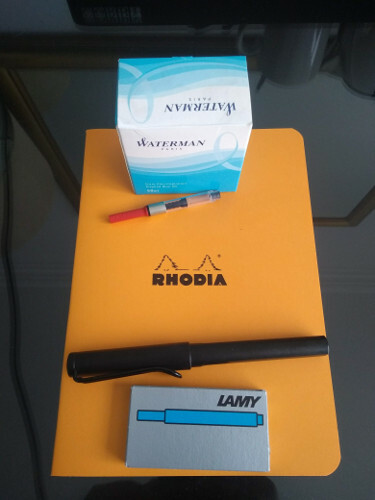 It’s a beauty to write with and two Rhodia notebooks. I’ve heard a lot of good things about Rhodia and it does handle fountain pens really well. I have a problem with hoarding stationery – especially notebooks. I’m finally using the paper I got from Tokyo last year. I’ve been using the meeting book though. It helps a lot to sit down after a meeting and write down notes and action items in pen and paper. It makes it more final for me rather than using a Google doc alone.